I am very aware that I am making radical leaps here by interpreting Verse III.45 as weather modification-control and ionospheric heating—as in HAARP. Reading and copying out the various definitions of the individual Sanskrit words, I kept arriving at the same conclusions. The words simply ‘arranged’ themselves for me on the page. I do not feel that this takes away from the sacred metaphysical truth in the Sanskrit texts. On the contrary, this only enhances our understanding of how great the Rishis were. I don’t expect a Sanskrit scholar to agree with me, although more and more the Vedic texts are coming to be regarded as scientific repositories. I currently have six books written by Indian scholars which offer evidence and conclude that Vedic verses in these ancient texts often point to quantum physics, string theory, astronomy, and other fields of science (see list of books below). It has been accepted that the Austrian physicist Erwin Schrodinger who ‘created’ quantum mechanics kept copies of the Sanskrit texts, the Upanishads and the Bhagavad Gita by his bed. I am not a scientist, quantum physicist, or a Sanskrit scholar. I admit that I have only been studying Sanskrit for 3+ years now and I am far from any mastery of the subtleties of Sanskrit grammar. However, my mother was the 7th child of the 7th child — and I am a bit of a visionary. In 1989 I experienced a six-month period of detailed visions revealing that this planet was colonized by a family group of extraterrestrials. I personally have seen over 30 UFOs. One very close in broad daylight on Mt. Shasta 1975; and in another experience in with two friends, we watched a battalion of ships enter ‘fly into’ the top of Mount Rainier. These ships are inter-dimensional, which means that they exist in a different waveform frequency that we do, but can cross into ‘appear’ in our dimension. The Sanskrit theory of the Cycles of Time explains all this neatly. We earth bound humans are currently trapped in the time frequency specific to the Kali Yuga, which limits us to our five senses. Five-sense reality consists of signals transmitted to and interpreted by the brain, and is only the surface of external appearances — a small portion of existence. Any great master will tell you that you can never hope to understand the totality of Creation and God as the Oneness through the five senses. In the previous cycles of time our perceptions are not limited to the five senses. We have other means such as telepathy, far sight, and could see and access the Myriad Worlds, the other dimensional realms. Mythology is our collective memory of this. It is only in the Kali Yuga that we are limited to five-sense reality and writing becomes necessary. In fact writing is a ‘symptom’ - like an illness - of the Kali Yuga. Scholars disagree about the meaning of the Sanskrit words in the Rig Veda. The Sanskrit of this ancient text is very different than other later texts such as the Upanishads or the even later Puranas. “The language of the Rig Veda is archaic and contains such grammatical devices and linguistic forms which are beyond the reach of the common mind…Among the devices are mystic illusions, configurations of similar sounds and words, metaphors, incongruous grammatical formations, un-sequential syntactical relations and Word-Economy; and these create a sort of sacred quiz, which taxes the ingenuity of even the most learned one…There is considerable disagreement among the interpreters of the Rig Veda, particularly in the interpretation of individual words.” (The Rigveda, Mandala III, Shukla & Shukla). The chronological order of the Sanskrit texts is assumed by an analysis of the Sanskrit itself, which like any language changed over the centuries. In this manner the Mandalas (sections) in the Rig Veda have been given an order. The three earliest Mandalas are VI, III & VII. (The Rigveda, A Historical Analysis’ S.G. Talageri). “Vishvamitra speaks: Rivers, charged with water, rest a moment from your course at my request… The rivers speak: Hymner, we hear your words, that you have come afar … we bow down before you…” (This is not my translation. RGVEDA SAMHITA, Vol. II, Translation of H.H. Wilson). I am suggesting that in the previous cycles of time, these technologies were known to the scientists of the ancient world and India. Atlantis was reputed to use advanced techniques of weather modification. It is only very recently that we would even be able to apply an understanding of Ionospheric Heating to these Sanskrit words. Indra is not an individual but a station, a title. Indra must be the title of the topmost commander scientist. 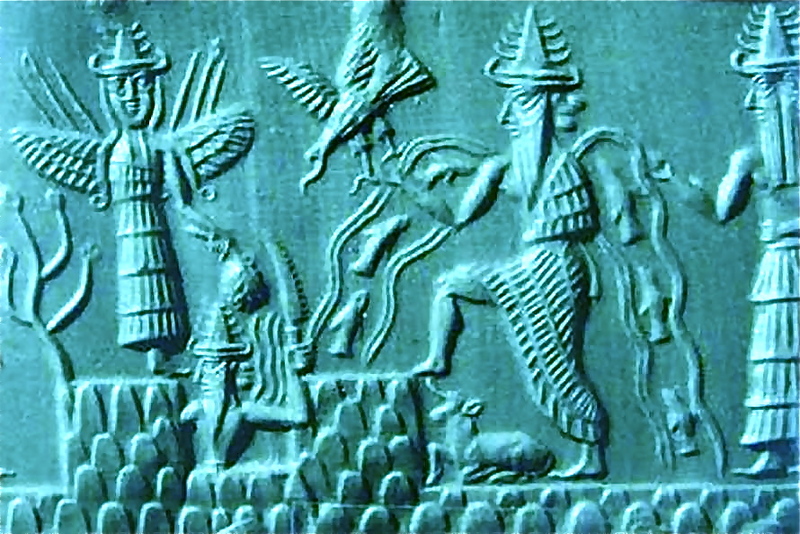 In Hinduism, Indra is known as ‘the god of rain’ and said to ‘push up the sky’ — which HAARP also does when it heats up the ionosphere — releasing dawn (Ushas) from the Vala cave, and defeating the demon Vritra who was ‘holding’ the waters of the world thereby releases the waters necessary for human life, agriculture, etc. These Indras, the great ones, commanding leaders, adepts, the Rishis, Seers (who could ‘see’ beyond limited five-sense reality), perhaps as head astronauts and scientists, would have complete knowledge and mastery over the metaphysical principles of the universe — which are the eternal subtle structures underlying the principles of 3D physics. Consider also the fact that the Indus Valley or Harrapan civilization, which was contemporary with Mesopotamia and Egypt, is now thought to have disappeared because the Saraswati River dried up due to a cataclysmic earth event. For the last 5000+ years of written history, we humans struggled along killing each other, barely able to invent the wheel and suddenly after the 1940’s we have an exponential explosion of amazing technologies – most of which I feel sure are still being kept from us. This just happened to occur after the Roswell event in 1947. HAARP came into full being in 1958. I believe that the ancient astronaut/Rishis have returned, are here, and have already given a few humans these ancient technologies, the conclusive evidence for which I find hidden in these verses in Rig Veda Mandala III.45. It is absurd to insist that planet Earth and the beings here are the sole life form manifestations of the Infinite Eternal Oneness in a universe with millions, perhaps hundreds of billions of galaxies. My translation/interpretation of these verses may be far from perfect, but I feel there is enough evidence here to suggest that Mandala III.45 is a description of Inonospheric Heating and weather modification as it was practiced by the ancient world. More on the amazing Vishvamitra soon. VISVAMITRA, Life & Vision of Vedis Seers, Vol,1, by Professor Satya Prakash Singh; Standard Publishers (India), New Delhi, 2033.